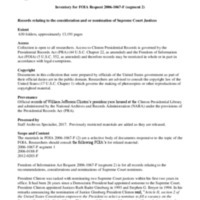 Identifier is exactly "2006-1067-F Segment 2"
This collection consists of records related to the consideration and/or nomination of Supreme Court Justices. When President Clinton took office, it had been 26 years since a Democratic President had appointed someone to the Supreme Court. President Clinton appointed two Supreme Court Justices within his first two years in office, Ruth Bader Ginsburg in 1993 and Stephen G. Breyer in 1994. The files contain correspondence, handwritten notes, reports, resumes, profiles, memoranda, clippings, press releases, and emails. Most of the correspondence and memoranda concentrate on the accomplishments of those considered.